I knew that Jesus had a plan for me,” said Samantha. Brazil is the largest country in South America and the only one in which the people speak Portuguese. The Amazon River flows through Brazil; it is the second longest river in the world (after the Nile). Around 60% of the Amazon rain forest is located in Brazil. Ever since she was young, Samantha loved listening to exciting stories about the Luzeiro mission boat. Fascinated, she imagined what it might be like to work as a missionary along the Amazon, just like Leo and Jessie Halliwell. Little did she know that one day her dream would come true. Doors opened quickly. “I was given money for the tickets, and people gave me everything I needed. I knew that Jesus had a plan for me,” said Samantha. 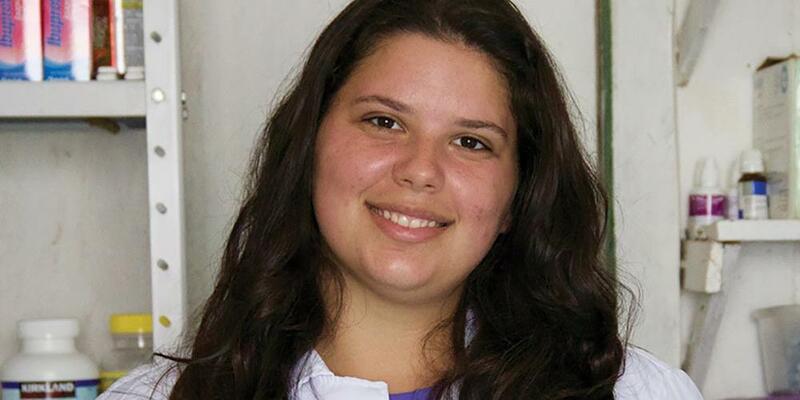 As a Luzeiro nurse, Samantha now works with ADRA (Adventist Development and Relief Agency) and is based in a village where she operates a small clinic. Every week she goes on the Luzeiro XXVI, providing the only health care available to thousands of people along the Amazon. Whether on the Luzeiro or in the village clinic, Samantha often faces emergencies where she knows only God can help. Early one evening, a man arrived at the clinic, holding his hand in bloodied bandages. “I was using a grinder and my hand got caught in the blades,” he answered. Samantha and her assistant, Gloria, carefully cleaned the hand, applied antibiotic ointment and rewrapped it tightly in clean bandages. As they prayed with the man, they knew that he needed a higher level of care than they were able to provide, and asked God for help. A few minutes later, a mother, father, and 10-year-old boy showed up in front of the clinic. The boy had been bitten on the foot by a Surucucu, a venomous pit viper—one of the most poisonous snakes of the Amazon. “How long ago was he bitten?” Samantha asked. “About five hours ago,” came the reply. Samantha was shocked. According to all the medical literature, the boy should have been dead long before now. Quickly she provided emergency care, doing all she could to stop the spread of the poison. Samantha knew that it was only through a miracle that the boy was still alive, and to survive he would continue to need divine help. She also knew that both boy and man needed to be taken to the nearest hospital—an eight-hour trip by regular boat, or two hours by ADRA’s fast boat—the Jessie Halliwell. While the fast boat was clearly the best option, it also took the most fuel, and would completely deplete the clinic’s reserve for the month. The fuel reserve had been saved for emergencies that might arise from a visiting group who had come to make improvements to the clinic and village. Knowing that two lives were in jeopardy, Herber Kalbermatter, the ADRA Brazil director for the Amazon region, approached the group and explained the situation. Immediately they told him to use the fuel and that they would trust in God for protection. It was dark and rainy by the time Samantha, her two patients, and the boy’s mother climbed into the Jessie Halliwell for a fast two-hour ride to the nearest hospital. Pelting-down rain mixed with river spray as the little boat and its precious cargo sped down the river. At last the little group arrived at Manacapuru, the closest town. The boy was admitted to the local hospital, but the man was taken to the large hospital in Manaus. Samantha didn’t see the man again, but after a week was able to visit the boy in the hospital. “When I see the boy now, I think ‘Jesus is awesome!’ He put His hand on the situation and saved two lives. Life in the village isn’t easy—with limited water and electricity (three hours a day), no phones or internet, and very little contact with the outside world. But Samantha doesn’t mind. “Just in the time I’ve been here, I feel my life has changed. I realize now what’s really important in life. I understand much more about Jesus, and I believe that He brought me here.